Biodiversity must be conserved as a matter of principle, as a matter of survival, and as a matter of economic benefit. History indicates that in the face of crisis, human ingenuity, creativity, discoveries, inventions, and new solutions cascade forth. Today almost all major studies point to a coalescence in the next few decades of significant land degradation, population growth, water shortage, fertile soil erosion, biodiversity loss, and spread of huge urban areas. Society is comfortable in thinking of small spaces and short times, or at best considering trends separately. When the trends are connected, it is hard to miss the crisis looming. The timetable says we and our children will be there. At center stage will be land-use pattern. 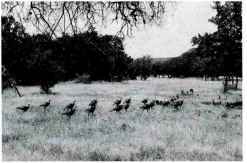 Wild turkeys crossing an opening, Texas, U.S.A., USDA Soil Conservation Service photo. 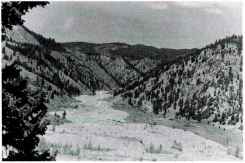 Gold mining spoils on ftoodplain, Montana, U.S.A., USDA Soil Conservation Service photo. Land planners and landscape architects are uniquely poised to play key roles for society, to provide new solutions. These are professionals and scholars who focus on the land. Solve problems. Design and create plans. Look to the future. Are optimists, can-do people. Are synthesizers who weave diverse needs together into a whole. Have ingenuity and creativity. Know aesthetics or economics. Know that human culture is essential in a design or plan. And know that ecological integrity of the land is critical. Landscape architecture and land-use planning have a long and distinguished history of inspired accomplishments. The images of extensive Italian country villas, 19th-century planning and design of major American cities, and the 20th-century development of national parks are impressive harmonies in the land. A key to their brilliance is the enlightened meshing of nature and culture. Channelized stream corridor, Georgia, U.S.A., USDA Soil Conservation Service photo. The designers and planners were not amateurs in either nature or culture, but had extensive education and knowledge in both. Nature included the biological patterns and physical processes entwined in vegetation, wildlife populations, species richness, wind, water, wet-lands, and aquatic communities. Culture integrated the diverse human dimensions of economics, aesthetics, community social patterns, recreation, transportation, and sewage/waste handling. In some countries these two basic components—ecology and culture—have diverged relatively recently. For example, ecology has matured, and veered away from planning and design. Or economics has become paramount. Or aesthetics. Or sewage and wastes have been considered only an engineering problem. Or flourishing litigation has colored decision-making. Or local actions have overridden regional thinking and planning. These sound so familiar to professionals in the field. The deeper message is the importance of a new form of linkage between ecology and culture, land and people, nature and humans. There is an increasing evidence suggesting that mental health and emotional stability of populations may be profoundly influenced by frustrating aspects of an urban, biologically artificial environment. It seems likely that we are genetically programmed to a natural habitat of clean air and a varied green landscape, like any other mammal. The specific physiological reactions to natural beauty and diversity, to the shapes and colors of nature, especially to green, to the motions and sounds of other animals, we do not comprehend and are reluctant to include in studies of environmental quality. Yet it is evident that in our daily lives nature must be thought of not as a luxury to be made available if possible, but as part of our inherent indispensable biological need. Frederick Law Olmsted, in Biography, by J.E. Todd, 1982. The missing ingredient and key to the new weaving appeared in the 1980s, and mushroomed in the 1990s. Landscape ecology, the ecology of large heterogeneous areas, of landscapes, of regions, of portions thereof, or simply of land mosaics, has increasingly appeared on the palette. It is at exactly the right spatial scale. It explicitly integrates nature and humans. Its principles work in any landscape, from urban to pastureland and desert to tundra. Its spatial language is simple, catalyzing ready communication among land-use decision-makers, professionals, and scholars of many disciplines. And it is no academic musing, but, centered on spatial pattern, is easily and directly usable. It often evokes, "Why didn't we think of that?" or "Good to know there's science behind it now." Urban-rural edge, Virginia, U.S.A., USDA Soil Conservation Service photo. Landscape architects and land-use planners will always be experts in small areas, the tiny parks, housing clusters, and shopping malls. At the same time, such professionals also know that only designing and planning little pieces of the land leads to a fragmented world that doesn't work, either ecologically or for people. Fortunately, the knowledgeable meshing of humans and ecology at a broader scale is now in the repertoire, and will become routine. The solution for a small economically or aesthetically focused project will emanate as much from the surrounding mosaic pattern as from the site itself. And the larger land-area project will focus directly on spatial pattern, movements, and changes of its mosaic, based solidly on principles of landscape and regional ecology. The objectives of this book are to: 1. Pinpoint many key principles of landscape ecology, especially those directly usable in land-use planning and landscape architecture. 2. Illustrate how principles can be used in planning and design projects. The key literature and concepts of landscape architecture and land-use planning are doubtless well known to the reader. However, a brief background in landscape ecology appears useful. The foundations may be traced back to scholars up to about 1950, who elucidated the natural history and physical environment patterns of large areas. Certain geographers, plant geographers, soil scientists, climatologists, and natural history writers were the "giants with shoulders" upon which later work stood. From about 1950 to 1980 diverse important threads emerged, and their weaving together commenced. 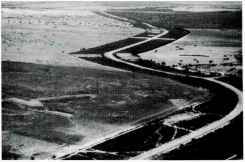 The term landscape ecology was used when aerial photography began to be widely available. 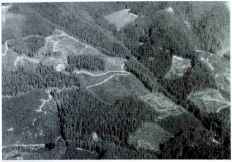 The concept focused on specific spatial pattern in a section of a landscape, where biological communities interacted with the physical environment (Troll 1939, 1968). Diverse definitions of the term of course have appeared over the years, but today the primary, most widely held concept is as follows. over which particular local ecosystems and land-uses recur. These concepts have proven to be both simple and operationally useful. Thus landscape ecology is simply the ecology of landscapes, and regional ecology the ecology of regions. Fields, woods, and hedgerows, New Jersey, U.S.A., USDA Soil Conservation Service photo. 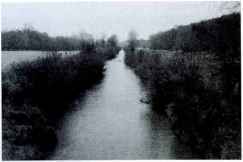 Fields, wooded patches, and wooded corridors, England, R. Forman photo. Several other disciplines or important concepts were incorporated during this weaving phase of landscape ecology. The ecosystem concept, animal and plant geography, vegetation methodology, hedgerow studies, agronomic studies, and island biogeographic theory were important. Also quantitative geography, regional studies, human culture and aesthetics, and land evaluation were incorporated. 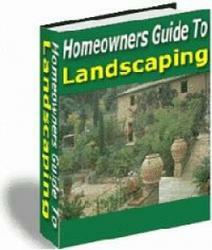 Landscape architecture and land-use planning literature began to be included. This phase produced an abundance of intriguing, interdisciplinary individual designs, but no clear form of the overall tapestry was evident. 1991), corridors and connectivity (Schreiber 1988, Brandle et al. 1988, Saunders & Hobbs 1991, Smith & Hellmund 1993), quantitative methodology (Berdoulay & Phipps 1985, Turner & Gardner 1991), and heterogeneity, boundaries, and restoration (Turner 1987, Hansen & di Castri 1992, Vos & Opdam 1992, Saunders et al. 1993). est clearcuts and logging roads, ¡gon, U.S.A., R. Forman photo. The major authored volumes, in contrast, tend to integrate and synthesize theory and concepts. These books include land evaluation and planning (Zonneveld 1979, Takeuchi 1991), soil and agriculture (Vink 1980), logging and conservation (Harris 1984), total human ecosystem (Naveh & Lieberman 1993), hierarchy theory (O'Neill et al. 1986), statistical methodology (Jongman et al. 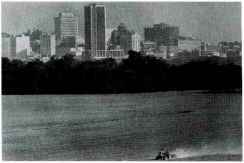 1987), river corridors (Malanson 1993), and land mosaics (Forman & Godron 1986, Forman 1995). Of course, to gain a solid and full understanding of the subject, articles in Landscape Ecology and many other journals are a must, and often a delight. The principles of landscape and regional ecology apply in any land mosaic, from suburban to agriculture and desert to forest. They work equally in pristine natural areas and areas of intense human activity. The object spread out beneath an airplane, or in an aerial photograph, contains living organisms in abundance, and therefore is a living system. Like a plant cell or a human body, this living system exhibits three broad characteristics: structure, functioning, and change. Landscape structure is the spatial pattern or arrangement of landscape elements. Functioning is the movement and flows of animals, plants, water, wind, materials, and energy through the structure. And change is the dynamics or alteration in spatial pattern and functioning over time. The structural pattern of a landscape or region is composed entirely of three types of elements. Indeed, these universal elements—patches, corridors, and matrix—are the handle for comparing highly dissimilar landscapes and for developing general principles. They also are the handle for land-use planning and landscape architecture, since spatial pattern strongly controls movements, flows, and changes. The simple spatial language becomes evident when considering how patches, corridors, and the matrix combine to form the variety of land mosaics on earth. What are the key attributes of patches? They are large or small, round or elongated, smooth or convoluted, few or numerous, dispersed or clustered, and so forth. What about corridors? They appear narrow or wide, straight or curvy, continuous or disconnected, and so on. And the matrix is single or subdivided, variegated or nearly homogeneous, continuous or perforated, etc. These spatial attributes or descriptors are close to dictionary definitions, and all are familiar to decision-makers, professionals, and scholars of many disciplines. 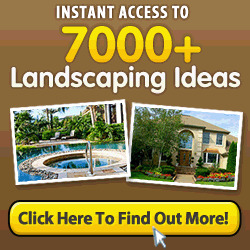 For example, changing a mosaic by adding a hedgerow, pond, house, woods, road, or other element changes the functioning. Animals change their routes, water flows alter direction, erosion of soil particles changes, and humans move differently. Removing an element alters flows in a different manner. And rearranging the existing elements causes yet greater changes in how the neighborhood functions. These spatial elements and their arrangements are the ready handles for landscape architects and land-use planners. Natural processes as well as human activities change landscapes. In a time series of aerial photographs a sequence of mosaics typically appears. Habitat fragmentation is frequently noted and decried. But many other spatial processes are evident in land transformation, such as perforation, dissection, shrinkage, attrition, and coalescence, each with major ecological and human implications. The whole landscape or region is a mosaic, but the local neighborhood is likewise a configuration of patches, corridors, and matrix. Landscape ecologists are actively studying and developing principles for the biodiversity patterns and natural processes in these configurations or neighborhood mosaics. Road corridor, Western Australia, Photo courtesy of B.M.J. (Penny) Hussey. 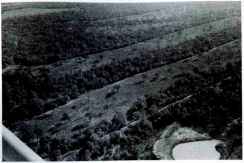 Strips and pond made for wildlife, Texas, U.S.A., USDA Soil Conservation Service photo. In short, the landscape ecology principles in this book are directly applicable and offer opportunities for wise planning, design, conservation, management, and land policy. The principles are significant from neighborhood to regional mosaics. They focus on spatial pattern, which strongly determines functioning and change. Their patch-corridor-matrix components have universality for any region. And their language enhances communication and collaboration. They will become central as society begins to seriously address the issue of creating sustainable environments.